Any automatic garage door owner knows how convenient it is to have their overhead door open and close without them having to do anything more than press the right button. However, if something went wrong and the system was unable to function properly, that lovely convenience will quickly go out the window, and become a serious, potentially dangerous, nuisance. We can help you when something like this happens. Our technicians have a great deal of experience fixing pretty much every type of opener related problem that could inflict your device. We work with units of every make and model, and our technicians are highly skilled at handling anything from a broken motor gear to a malfunctioning circuit board. We'll solve the problem in little to no time at all, either by repairing the damaged component, or by replacing it with one of a matching or better quality. Some opener problems can be extremely dangerous. 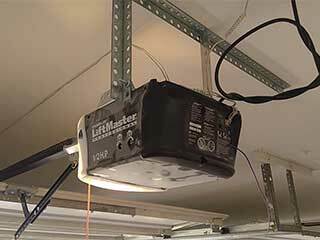 Since the proper operation of your garage door depends on this device, you need to regularly make sure that is up to standard. We have a regular maintenance service that can ensure that. We will inspect every single one of your opener parts, make sure they are in a great working condition and replace them if they aren't. If you have a chain-drive opener we'll make sure the chain is well adjusted, and we'll lubricate the drive system to keep its operation smooth and efficient. Another key focus of our opener maintenance service is testing the photo-electric eyes to make sure they are positioned correctly. Safety sensor realignment is incredibly important, so you can rely on our team to make sure your door is safe to use. These delicate components are in charge of obstacle detection, and they need to be handled by a professional to keep their lenses from getting damaged. It doesn't matter what problem is affecting your opener, our team at Garage Door Repair Sherman Oaks can handle them all. Contact us for more information.